Deliciously Savvy received product as a Chewy.com Influencer in exchange for an honest and unbiased review and all opinions are 100% my own. Regardless, I only review products that I am truly interested in for myself and my family and that of course involves my furry family members. Thanks for stopping by and enjoy! It is no secret that I love my furry family members as they are both the most amazing and loyal companions that a person could hope for. I love them dearly and that is the reason I had to share my love for Chewy.com as they have all of the products that I need to care for and nurture my furry BFF’s! I love Chewy.com’s prices as they are amazing and I never need to “shop around” so to say. I also love that they deliver straight to my front door which is amazingly convenient with the busy and hectic lives we live today and their shipping time is lightning fast… seriously. This month I took advantage of some special offers and treated my furry BFF’s with some new items and they both loved their selections. My little Chihuahua can be a bit picky so I am always looking for a new soft food for him that he will love and enjoy and that is why I had to give Hill’s Science Diets Adult Small & Toy Breed Savory Chicken & Vegetable Stew Dog Food Trays a try as I love the brand in general. To my surprise Chewey took to these delicious meals immediately and I am actually going to reorder these meals today as he truly enjoyed them and literally licked his bowl clean each and every time. 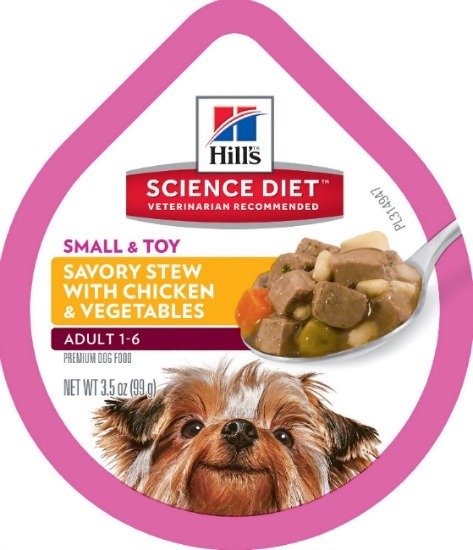 Hill’s Science Diet Adult Small & Toy Breed Savory Chicken & Vegetable Stew Dog Food Trays allow you to serve up a special meal for your furry friend. These convenient single serving tubs are the perfect way to provide your paw-tite little pooch with a delicious, well-balanced meal. Made with high-quality lean protein to help maintain ideal body conditions and gentle fibers designed to promote healthy digestion for overall health and wellness, this tasty meal is the perfect way to keep your pet in shape. Expertly developed by Hill’s nutritionists and veterinarians, this delicious meal allows you to pamper your small breed pooch while providing them with a healthy wholesome meal. This premium dog food provides ideal levels of high-quality lean protein for building muscle and maintaining ideal body composition. Made without the use or artificial colors and preservatives for a natural, wholesome diet. Available in convenient peel and serve trays that are perfectly sized for adult small and toy breed dogs. Contains gentle, high-quality fibers which are designed to aid in proper digestion. This nutritious formula is ranked Veterinarians’ #1 choice to feed their own pets. I also had to pick something up for my favorite feline and Shadow the cat is also a picky eater so it can be hit or miss with him… but one brand that he always enjoys is Fancy Feast. I decided to give the Fancy Feast Purely Filets Natural Variety Pack Cat Food Topper a try and sure enough Shadow was in love. We received the box with 3 varieties and 2 quantities of each. Shadows favorite was definitely the Tuna although he ate them all so that says enough for me. I will make sure to stock up on his favorite but still have the other two varieties so that I can change it up for him. 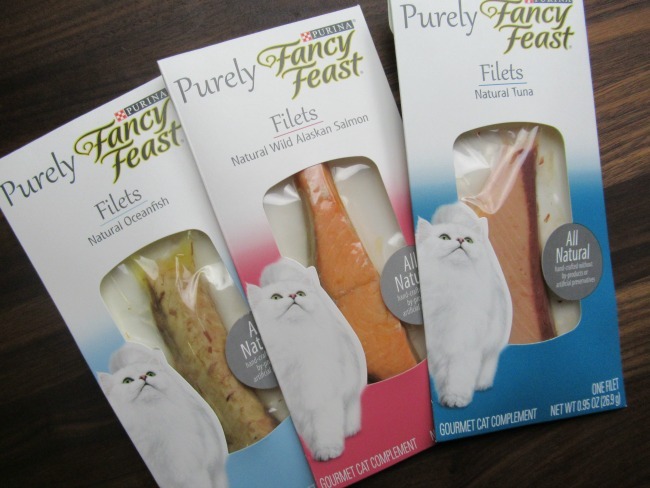 Fancy Feast Purely Filets Natural Variety Pack Cat Food Topper’s deliver more of the savory seafood flavors your cat loves to his or her dish. Each pack includes recipes made with 100% natural tuna, salmon or oceanfish to take your cat’s everyday dining experience to a whole new level of sophistication. The complements feature a tender texture, while each filet can be served whole or flaked for versatile serving options to surprise her taste buds. She gets all-natural cat food complements made with real ingredients you can see, so you can both feel good about serving it to her or him. 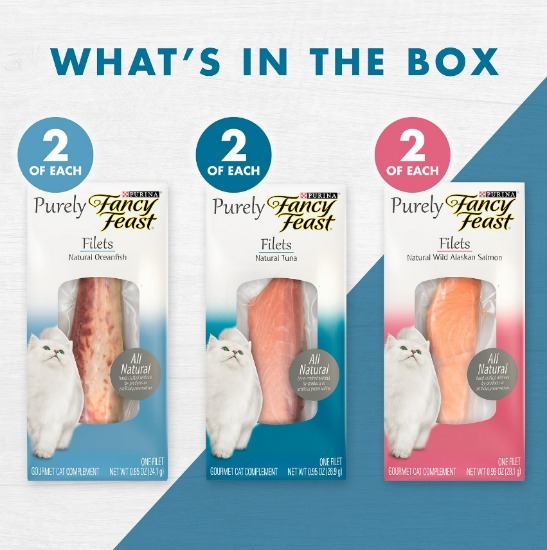 Let your cat companion choose between the three equally delectable recipes in this variety pack, and give her the gourmet seafood flavors worthy of his/her sophisticated palate. Made with 100% natural oceanfish, tuna or salmon for a different, flavor-packed meal each night. Prepared without by-products, so you can feed your fur baby a savory meal with real meat you can trust. Contains no artificial colors, flavors or preservatives for a tasty meal complement as real as your love. Features real, carefully selected ingredients you can be proud to put in your kitty’s bowl. Serve whole, flaked or as a topper on dry food for a variety-packed menu that’ll keep your kitty curious about dinner. These are just a few of the products that I pick up from Chewy.com and I just love their prices and service. Make sure you check Chewy.com out for yourself and pick up some pet products for your family friend today! Their shipping is so fast and their prices are amazing… so stock up and give them a try with everything delivered conveniently to your doorstep. This is hands down the best way to shop for your pets and they will appreciate you for it. As Always, Thank You For Visiting Deliciously savvy Today & Leave Some Comment Love Or Enter A Giveaway While You Are Here. I Always Love Hearing From You! 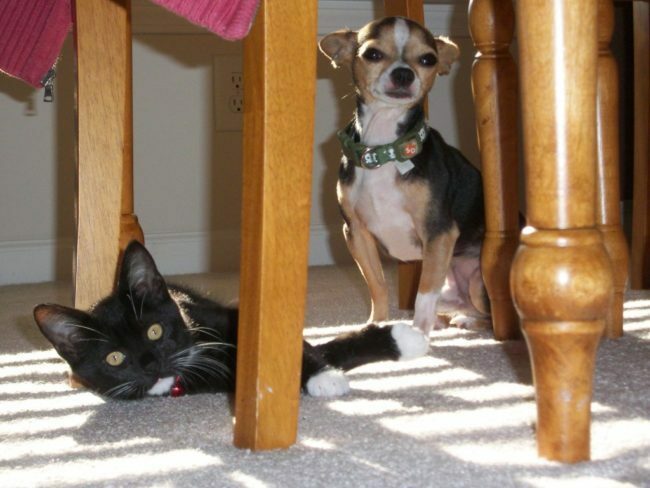 (Shop For Your Furry Family Members At Chewy.com & Enjoy Great Prices With Super Fast Shipping! @Chewy #ChewyInfluencer) Wow! I did not know about some of these good cat foods and treats. Guess I need to get out more. These Fancy Feast filets sound awesome, our Rosie would love them! We actually started with Chewy.com right when we got her a couple of months ago. I absolutely love that I can buy her food for a good price (I can’t buy this brand at regular stores and it is overpriced at pet stores) and the autoship is SO handy! (Shop For Your Furry Family Members At Chewy.com & Enjoy Great Prices With Super Fast Shipping! @Chewy #ChewyInfluencer) My son and daughter-in-law order their furry friend food and treats from Chewy on-line. They have a border collie named Mia, two cats named Jango & Teddy, and a bunny rabbit named Jordie. They have a house full! I wish Chewy had been around when we had our last dog. I know he would have loved stuff like this. I love Chewy.com. With three dogs and a cat it makes meeting their needs to much easier. I really dislike going to the store and Chewy helps with that. Chewy.com looks like a nice website to go to for my furry friends.